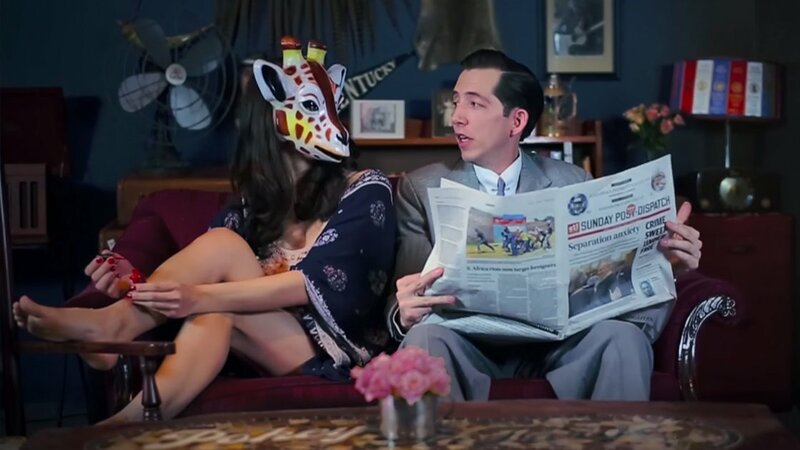 Pokey LaFarge has himself a crazy woman, and she's the subject of his new single "Something in the Water," taken from the upcoming album of the same name. In the video, Pokey sings about his lady-friend as the visuals support each word he says. The woman is completely insane, but you know what? Pokey loves it. She cracks an egg on his forehead, spits water on his face, and curls her hair with beer cans. "What makes her crazy? I don’t know / Never seen anything like her before / There must be something in the water," he sings over vintage pop music. It has been joked that Pokey LaFarge is about 70 years too late in being a huge pop star, but that isn't to say his sound is completely outdated. In a world where vintage is cool, Pokey's new take on old-time music is an odd breath of fresh air. His quirky new single is completely infectious, and I dare you to listen without getting it trapped in your brain. Something in the Water is available for pre-order on Amazon (Vinyl, CD). For Pokey LaFarge's latest music, news, and tour dates, check out his Zumic artist page.